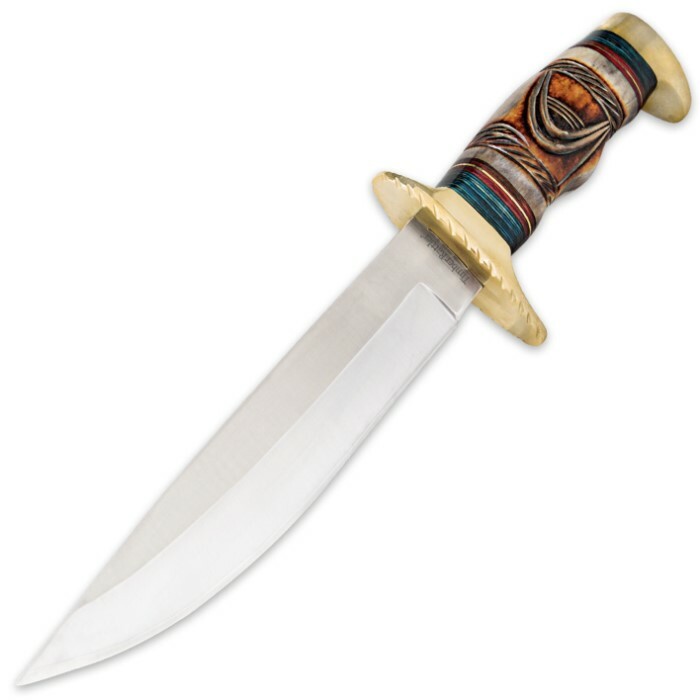 Timber Rattler Whispering Winds Bowie Knife Genuine Bone Fixed Blade | BUDK.com - Knives & Swords At The Lowest Prices! 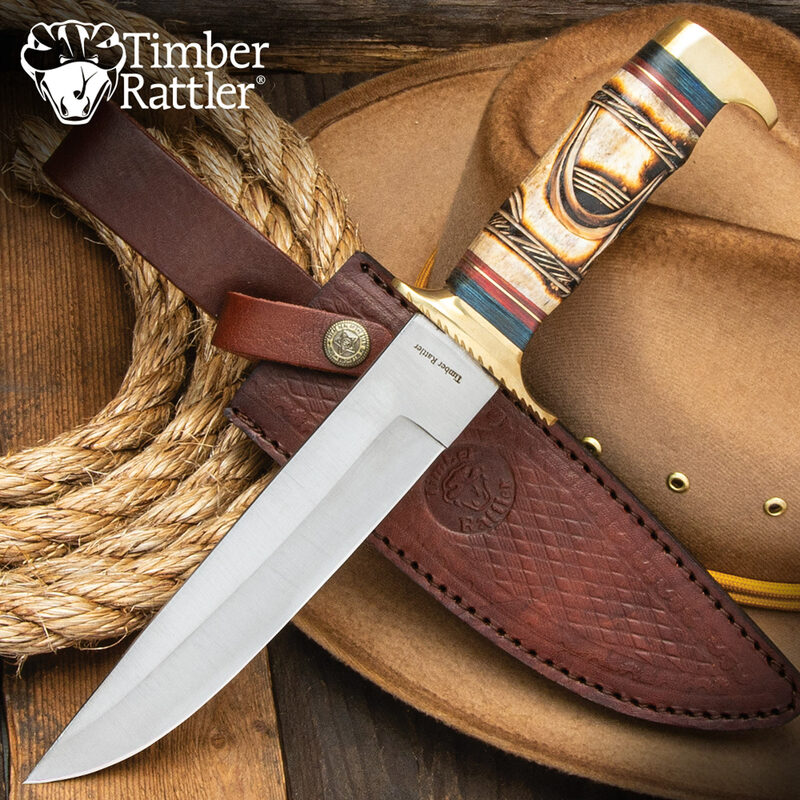 Timber Rattler captures the beauty of the southwest with this handsome Whispering Winds bowie knife. This traditionally deigned bowie knife features a 7-1/4" stainless steel blade that has been honed to a razor-sharp edge with a drop point. This is a hefty knife with a weighty feel and imposing presence. 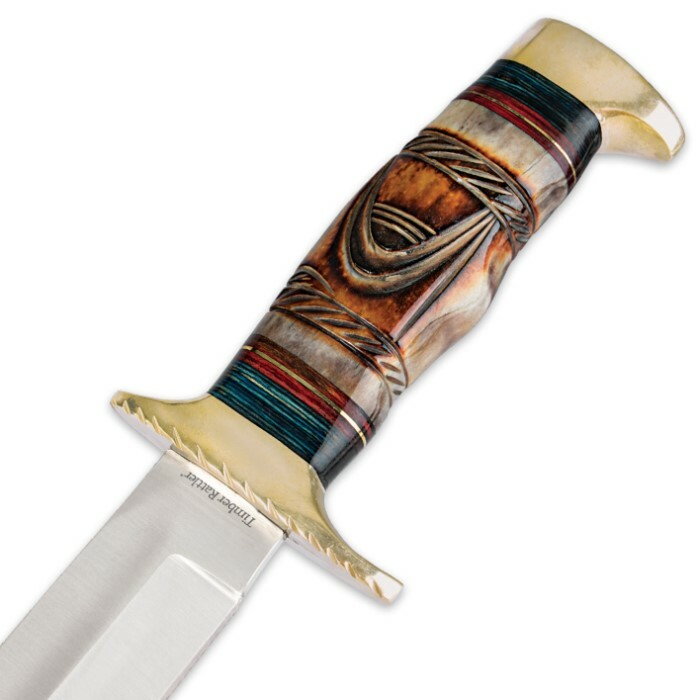 Custom details abound including the genuine burnt bone handle which features intricate hand carvings, colorful pakkawood inserts and solid brass spacers. A decorative brass guard caps the handle, and the brass hand guard features scalloped edges for additional detail. This heirloom-quality bowie knife provides you with an opportunity to own a piece with a custom-commissioned, one-of-a-kind look and feel at an affordable price point. A genuine leather sheath is included. As a rule I prefer clip point blades for my collection but this drop point is a beautiful exception. I've bought two and both are flawless. The price was irresistible on $10 Tuesday to get my second one. This knife is good looking. It has the typical Timber Rattler leather sheath. Functional sheath,not great, good. The flaw is in the handle. There is a two inch crack in the right side of the "bone"handle. This is an obvious and disappointing major flaw to an otherwise nice knife. Even though I bought the knife before the price change, it's worth the money, nicely designed bone handle and it can hold an edge, this knife is worth the money and very sharp. Beautiful handle art, sharp blade, and good sheath, well worth the money.